UNHRC vetting committee shortlists UK professor who blasted Israeli "apartheid" as its next "special rapporteur" on PA-ruled territories. 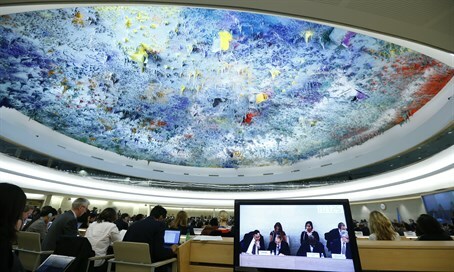 The UN Watch NGO revealed on Thursday that the UN Human Rights Council's (UNHRC) vetting committee has shortlisted a UK professor for a six-year term as the world body's investigator of "Israel's violations," even though she campaigns for the boycott of what she calls "apartheid Israel" and a "criminal government." Wibisono was himself a questionable choice for the role, and in his final report before stepping down, accused Israel of using “excessive force” against Palestinians. His predecessor was Richard Falk, another controversial figure was known for his anti-Israel stance. Now, it appears, the trend continues with the appointment of Green, as revealed in a report NGO Watch sent Thursday to the president of the 47-nation UNHRC, and to all UN member states. According to the report, following interviews with five out of ten applicants, the UNHRC’s Consultative Group (CG) — chaired by the representative of Egypt — on March 4th recommended two names: Penny Green of the UK, ranked first, and Michael Lynk of Canada, ranked second. The next step is for the Council president, South Korean ambassador Choi Kyong-lim, to consult broadly with UN member states and to select one of the applicants for the Council’s approval. While the custom is for the president to choose from among the names shortlisted by the CG, he has the authority to choose any of the ten applicants. This is indeed what took place in 2014 when the CG recommended human rights lawyer Christina Cerna for this position, yet the president and the Council in the end chose to appoint Wibisono. The decision by the plenary is scheduled to take place at the end of the current 31st session of the UNHRC, on Thursday, March 24, 2016. Palestinian, Israeli or other victims of human rights violations committed in the territories by the Palestinian Authority, Hamas or Islamic Jihad are ignored, noted the NGO. No other UN mandate on the human rights situation of a specific country discriminates in this fashion; no other presumes the existence of violations and prejudges guilt in advance; and no other mandate lasts forever without any review and need for renewal. The mandate, therefore, is inherently discriminatory, and must be changed. Green also promotes the work of extreme anti-Western ideologues like Noam Chomsky, Richard Falk, and Grietje Baars, and heads an institute that opposes Western counter-terrorism and anti-extremism efforts as manifestations of Islamophobia, UN Watch reveals. "Naming Penny Green as an impartial investigator of Israel is like making Donald Trump an impartial investigator of Mexicans — it's a mockery of the UN's own objectivity requirements, and a travesty of justice," said Hillel Neuer, executive director of UN Watch.